As the founder and principal of Shepherd Research LLC, Nancy brings a solid track record of business acumen and broad-based scientific expertise to every relationship. From molecular biology and genetics research at organizations such as the Max Planck Institute in Köln and Dupont’s Central R&D Department to senior management roles and responsibility for global business development and technology licensing for GlaxoSmithKline, Nancy’s breadth and depth of experience working with academia, government and industry to negotiate and close agreements ensures superior results for your organization. Ewald has brought proven leadership to start-up enterprises, multi-billion dollar corporations, mergers and acquisitions, IPOs and high-growth divisions and organizations. His consistent success in optimizing organizational and operational performance to drive growth and enhance value is driven by practical approaches founded in experience-based judgment and innovation. And Ewald’s extensive international experience means whether you’re looking to forge a deal overseas or trying to get your organization seen by US businesses, he can help bring partners together. Ken’s exceptional organizational and coordination abilities, coupled with his experience in life science sales, manufacturing, research and development, uniquely position him to enhance strategic direction for both executive and non-executive stakeholders. Ken experience in market assessment and strategic planning and positioning make him a valuable asset to clients. Experience and an extensive portfolio of contacts enables Shepherd Research to find highly focused experts to augment delivery of the highest quality product to our clients. Any work undertaken by an Analyst is administered and managed both intellectually and financially by Shepherd Research, LLC. 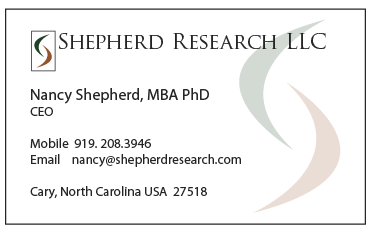 For information on partnering with Shepherd Research, LLC as a specialist consultant, please contact us.